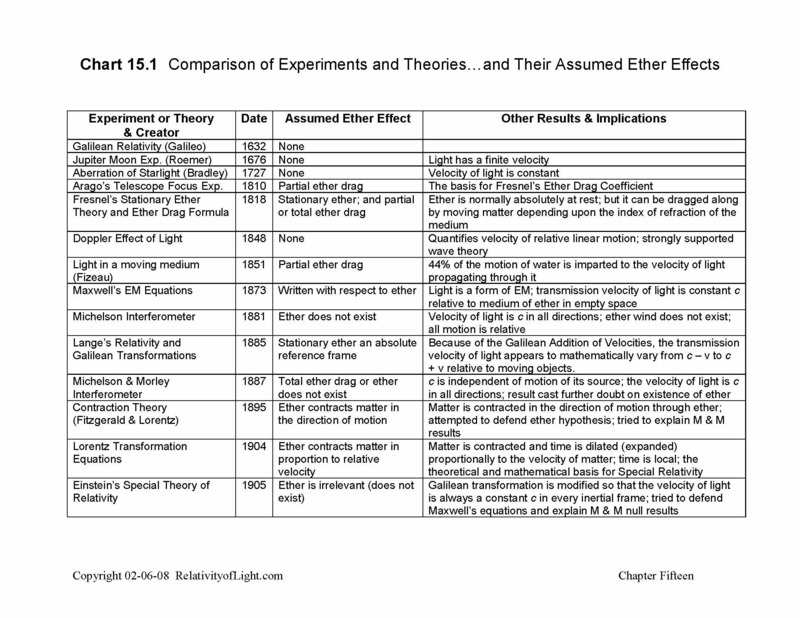 After the null results of the Michelson and Morley experiment were published in 1887, the various theories concerning the interactions between ether, the velocity of light and the motions of matter reached a critical impasse. No single theory could consistently explain the results, implications, contradictions, conflicts and paradoxes of numerous experiments and other theories (Chart 15.1). The door appeared to be wide open for someone to attempt to devise a new theory that would resolve all of these conflicts (Bergmann, pp. 26 – 27). “I have read with much interest Messrs. Michelson and Morley’s wonderfully delicate experiment attempting to decide the important question as to how far the ether is carried along by the earth. “I would suggest that almost the only hypothesis that can reconcile this [null result] is that the length of material bodies changes [contracts], according as they are moving through the ether or across it, by an amount depending on the square of the ratio of their velocity to that of light” (Fitzgerald, Science Newspaper, Vol. XIII, No. 328, 1889, p. 390). Although Fitzgerald referred to the 1887 M & M experiment, his contraction explanation is more applicable to Michelson’s 1881 experiment. In 1881, Michelson was attempting to detect a fringe shift equal to 10% of a wavelength, which according to Maxwell and Michelson should require a degree of precision to detect equal to. Whereas in 1887, Michelson was attempting to detect an even smaller fringe shift equal to only 4% of a wavelength, which might require an even greater degree of precision to detect (Chapter 9). 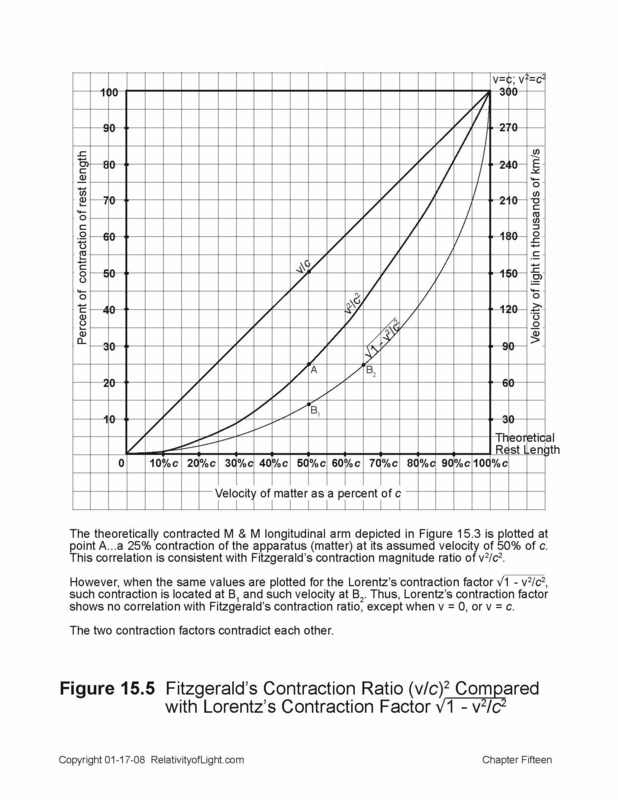 The magnitude of contraction that Fitzgerald was conjecturing was equivalent to at v = 30 km/s. This was the same ratio of magnitude that Maxwell suggested in his 1879 letter for a theoretical increase in the time interval of propagating light, and which Michelson was attempting to detect in his 1881 experiment. In effect, Fitzgerald hypothesized that if the length of every material object (i.e. the Earth) physically “contracts” or becomes shorter in the absolute direction of its absolute motion through the stationary ether, then every observer sharing the same motion of the shortened Earth (including Michelson, Morley, and the longitudinal arm of their apparatus) would also proportionally physically contract (Born, pp. 219, 220). According to Fitzgerald, these physical contractions of distance would in turn proportionally reduce the time interval which light had to propagate at its transmission velocity of c to and fro along the linearly contracted longitudinal arm of the apparatus, and in the direction of the Earth’s solar orbital velocity (Figures 15.2 and 15.3). A priori, the amount of this conjectured hypothetical contraction was just sufficient to mathematically compensate for the “undetected time interval” in Michelson’s experiments (Einstein, Relativity, p. 59). Several years later, in 1892 – 1893 and again in 1895, Lorentz also devised an ad hoc contraction hypothesis similar to Fitzgerald’s, which he likewise hoped could theoretically save the concept of stationary ether. Lorentz’s 1895 treatise concerned both his theory of the electron, and the first order “ether drag” light experiments referred to in his final chapter of such treatise, entitled, “Experimental Results Which Cannot be Accounted for Without Further Ado” (Goldberg, p. 96). The title of this final chapter (which described Lorentz’s contraction hypothesis in detail) was later changed to “Michelson’s Interference Experiment,” and in it Lorentz briefly referred to Fitzgerald’s somewhat different contraction hypothesis (Lorentz, 1895 [Dover, 1952, p. 4]). because Lorentz was attempting to explain Michelson’s 1887 experiment with Morley, which was attempting to detect a fringe shift equal to 4% of a wavelength, and its null result. Whereas Fitzgerald, as previously mentioned, was apparently attempting to explain away the null result of Michelson’s somewhat different 1881 experiment (which attempted to detect a theoretically larger fringe shift equal to 10% of a wavelength). 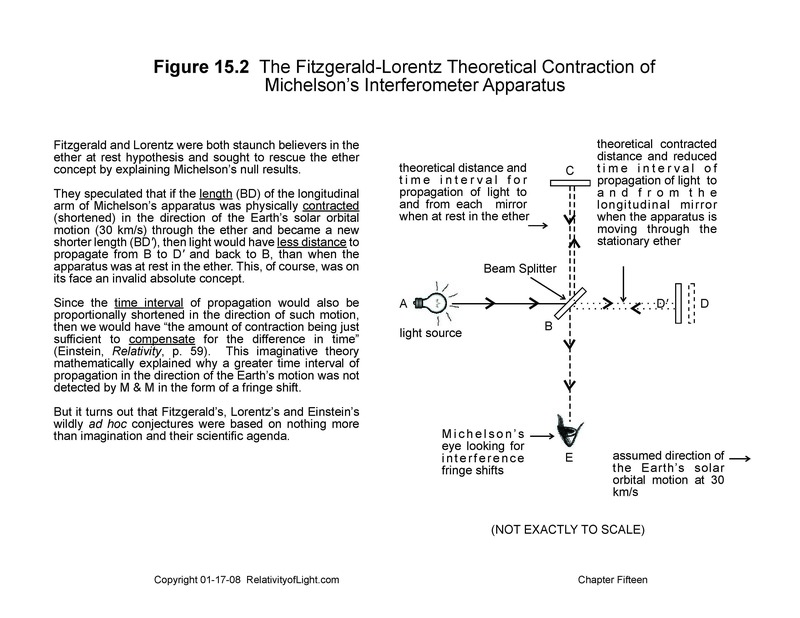 It is also important to realize that both Fitzgerald (in 1889) and Lorentz (in 1892 and 1895) were only attempting to justify Michelson’s specific null results with a specific magnitude of contraction at the absolute solar orbital velocity of 30 km/s and in the absolute solar orbital direction of such velocity. At any different or greater theoretical velocities their theories totally break down. 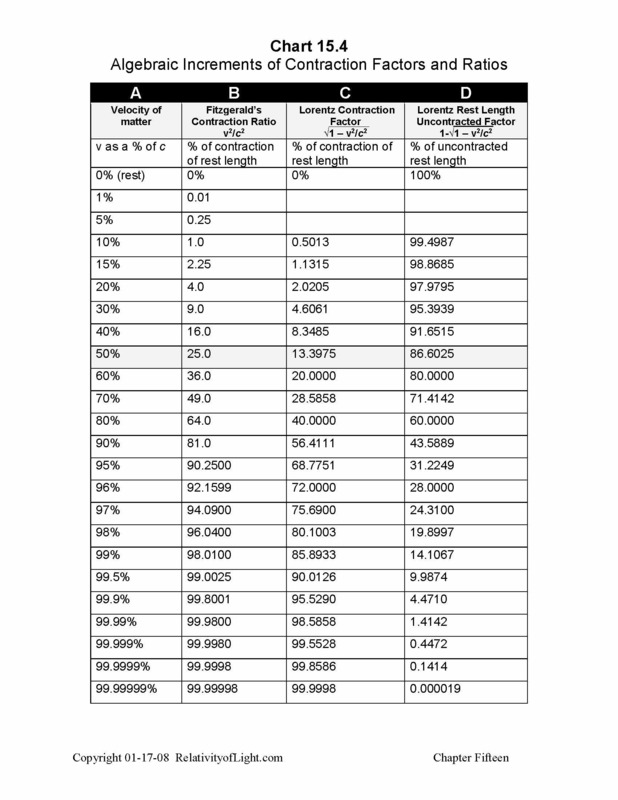 In any event, the two different theories and their two different magnitudes of contraction directly contradict each other (Chart 15.4 and Figure 15.5). All of these theoretical contractions could only a priori result with respect to stationary ether, which we now know does not exist. Therefore, such contractions were completely meaningless. “If we assume the arm which lies in the direction of the Earth’s motion to be shorter than the other by ½Lv2/c2…then the result of the Michelson experiment is explained completely” (Ibid, p. 5). “The shortening of the one diameter of the Earth would amount to about 6.5 cm. The length of a meter rod would change, when moved from one principal position into the other, by about 1/200 micron.… Revolving the apparatus we should perceive no displacement of the fringes” (Ibid, p. 6). Based on Lorentz’s above conjectures and rationalizations, we must ask the question, What was the longitudinal arm of the M & M apparatus shorter than? According to Lorentz and the ether theory, it was shorter than the length L of the transverse arm that was not oriented in the direction of motion and thus remained at the same length as if it were at rest in the ether (Lorentz, 1895 [Dover, 1952, p. 5]). This arbitrary concept was sometimes called the “rest length” of matter in Lorentz’s and other related theories, and mathematically it had a designated magnitude of 1. But of course we now know that this concept of absolute “rest length” was a myth. It was an impossible absolute concept, because there is no ether and there is no such thing as the absolute rest of a material object (Einstein, 1905d [Dover, 1952, p. 37]). It follows that there could be no contraction of a “rest length” that does not exist, and there could be no comparative measurement with respect to something that does not exist. Therefore, Lorentz’s contraction concept and his mathematical contraction factor were meaningless. 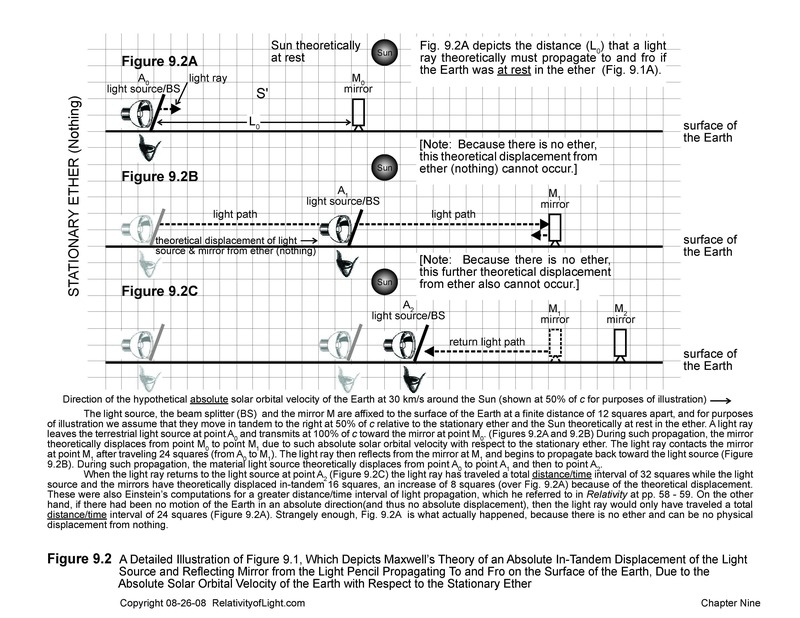 How did Lorentz explain the physical method by which each rotating arm became shorter than the other in the direction of the Earth’s solar orbital motion? “One would have to imagine that the motion of a solid body…through the resting ether exerts upon the dimensions of that body an influence which varies according to the orientation of the body with respect to the direction of motion” (Lorentz, 1895 [Dover, 1952, p. 5]). As Born points out: “The contraction hypothesis seems…almost absurd—because the contraction is not a consequence of any forces but appears only as a companion circumstance to motion” (Born, p. 220). In other words, it was merely an ad hoc hypothesis of the imagination without any physical justification. Lorentz also had an imaginary answer for Born’s criticism. He imagined in classicad hoc fashion that “molecular forces are also transmitted through the ether” which change the dimensions of the atoms in a solid body (i.e. the Earth and Michelson’s apparatus) and cause it to be contracted in the direction of its motion through the ether (Ibid, p. 6). Lorentz never stated a viable theory for what physically caused his hypothetical contraction, as Einstein later pointed out: “this key hypothesis, …is not justifiable by any electrodynamical facts…” (Einstein, Relativity, p. 57). In other words, Lorentz’s contraction hypothesis and his mathematical contraction factor served Lorentz’s theoretical agenda, but they were completely unjustifiable empirically and resulted solely from his imagination. “Imagine two mirrors so arranged on a rigid body that the reflecting surfaces face each other. 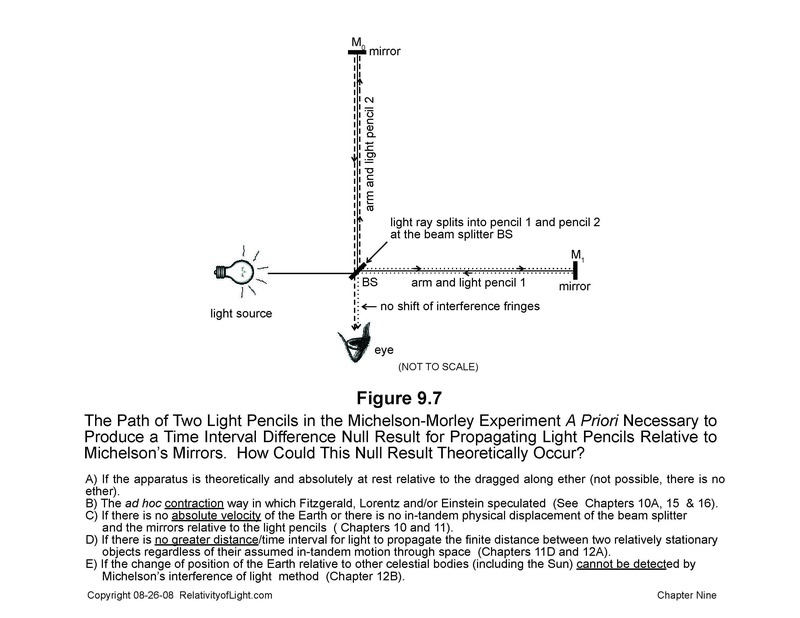 A ray of light requires a perfectly definite time T to pass from one mirror to the other and back again, if the whole system be at rest with respect to the aether. It is found by calculation, however, that a slightly different time T′ is required for this process, if the body, together with the mirrors, be moving relatively to the aether. And yet another point: it is shown by calculation that for a given velocity v with reference to the aether, this time T′ is different when the body is moving perpendicularly to the planes of the mirrors from that resulting when the motion is parallel to these planes. Although the estimated difference between these two times is exceedingly small, Michelson and Morley performed an experiment involving interference in which this difference should have been clearly detectable. But the experiment gave a negative result – a fact very perplexing to physicists (Einstein, Relativity, pp. 58 – 59). Einstein needed the concept of stationary ether for his Special Theory in order to describe the false assumptions of everyone, the impossible expectations of the scientific community, and the bewildering absolute M & M paradox which desperately needed an explanation…even though he postulated on the same page of Relativity (p. 59) that absolute rest and stationary ether could not exist. Again, the reason for Einstein’s need was that his Special Theory provided a false mathematical solution for Michelson’s paradox, which Einstein and his followers would later claim was an experimental confirmation for his Special Theory (Resnick, 1968, p. 37 and Chapter 22F). The first theoretical “definite” time interval described by Einstein assumes that the Earth and Michelson’s apparatus could be absolutely at rest in the stationary ether. 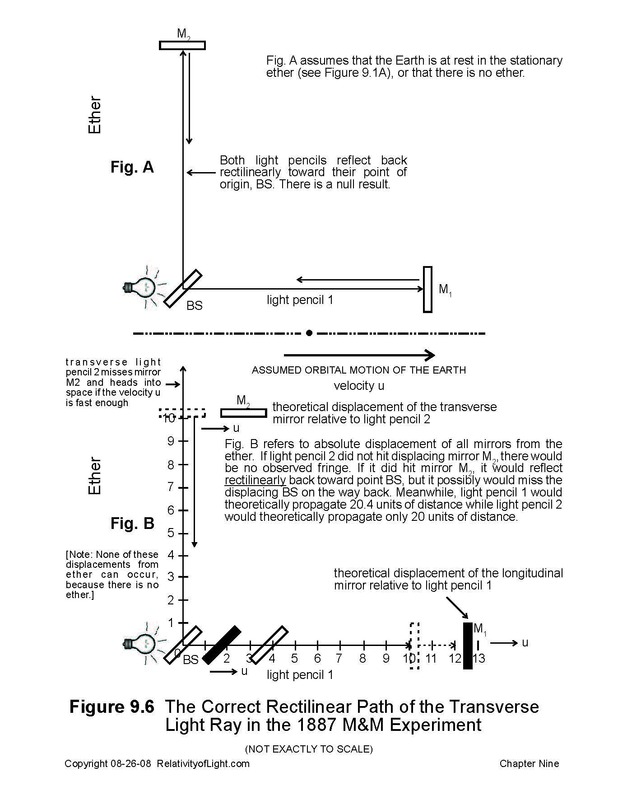 It is from this absolutely stationary reference frame that Einstein asserts: “a ray of light requires a perfectly definite time T to pass from one mirror to the other and back again” (Einstein, Relativity, pp. 58-59). The second theoretical time interval is also described by Einstein with reference to the absolutely stationary frame of ether. “Lorentz and Fitzgerald rescued the [ether] theory from this difficulty [Michelson’s paradoxical null results] by assuming that the motion of the body relative to the aether produces a contraction being just sufficient to compensate for the difference in time…[T]his solution of the difficulty was the right one” (Einstein, Relativity, p. 59). The above described absolute mindset concerning the detectability of such difference in absolute time intervals, reinforced by Einstein’s conjecture and conclusion that such “difference should have been clearly detectable” by Michelson and Morley (Einstein, Relativity, p. 59), lingers on even into the twenty-first century. It was also further reinforced by Einstein’s conjecture and conclusion that the proposed contraction solution for the M & M paradox presented by Lorentz and Fitzgerald “was the right one” (Ibid, p. 59). “There is no such thing as a “specially favored” (unique) coordinate system to occasion the introduction of the aether-idea…” (Ibid, p. 59). Next, Einstein claimed that such contraction did not really result from the ether or motion per se. According to Einstein: “the prime factor involved in this contraction we find was [not] the motion itself [or the motion with respect to the ether, but rather]…the motion with respect to the body of reference chosen in the particular case…” (Einstein, Relativity, pp. 59 – 60). In effect, according to Einstein, such contraction of Michelson’s apparatus resulted from the “relative motion” of the Earth and a mentally chosen reference body, all at a distance. This absurd and artificial idea was Einstein’s attempted relative mathematical “solution” for Michelson’s absolute physical and empirical paradox. It turned out that Einstein, in the above paragraph, was actually referring to his theoretical coordinate measurement and his “illusion of a contraction” of distance, which could theoretically occur in 1905 because at that time the coordinates for both ends of a moving rod could not simultaneously be measured by a human observer. This subject of an artificial coordinate measurement and an “illusion of contraction” of distance results from Einstein’s concepts of relativistic kinematics. nIn Chapters 26 and 28, we will fully discuss Einstein’s ridiculous concepts of relativistic kinematics, and we will demonstrate them to be ad hoc, arbitrary, invalid and completely meaningless. “for a co-ordinate system moving with the earth the mirror system of Michelson and Morley is not shortened, but it is shortened for a co-ordinate system which is at rest relatively to the sun” (Einstein, Relativity, p. 60). In Einstein’s so-called “relative solution” the Sun takes the place of the stationary ether at rest in Newton’s absolute space, so that Figures 9.1, 9.2, 9.5, and 10.1 can theoretically remain applicable with respect to the relatively stationary Sun. Thus, Einstein’s solution of perception and coordinate measurement and its illusions of a contraction remain nothing more than an ad hoc solution of desperation just like those of Fitzgerald and Lorentz. In Einstein’s so-called “relative solution” he was claiming that his artificial method for coordinate measurements results in a mathematical illusion of contraction, and that this illusion explains the physical and empirical M & M null results. As Einstein’s follower Resnick confirms, “No actual shrinkage is implied, [there is] merely a difference in measured results” (Resnick, 1992, p. 472). But, on the contrary, any contraction of Michelson’s apparatus would have to be an “actual physical contraction” in order to explain the M & M paradox. Without a physical contraction of distance there could be no physical and empirical explanation for the missing interval of time which was equivalent to the assumed greater distance. D. Fitzgerald’s, Lorentz’s and Einstein’s ad hoc mathematical contraction theories are meaningless. Referring to Lorentz’s and Fitzgerald’s contraction hypothesis, Einstein acknowledged, “this ad hoc postulate appeared to be only an artificial means of saving the [ether] theory” (Einstein, 1907 [Collected Papers, Vol. 2, p. 253]). Einstein was right. Nevertheless, Einstein claimed in 1916 that Lorentz’s artificial and unjustifiable ad hoc hypothesis provides us with the same mathematical law of motion as Einstein asserted in his Special Theory of Relativity; the purported difference being that Special Relativity does not require “any special hypothesis whatsoever as to the structure and behavior of the electron” (Einstein, Relativity, p. 57). In Einstein’s Special Theory, the contraction does not occur with respect to the ether, but rather “with respect to the body of reference chosen in the particular case…,” i.e. the Sun (Einstein, Relativity, pp. 59 – 60). This ad hoc conjecture was Einstein’s sole explanation for the M & M null result. Do the above attempted distinctions, rationales and conjectures by Einstein convince anyone? The only way that Einstein’s contraction theory could even theoretically work as an explanation for Michelson’s null results, would be based on the ether theory where the absolute velocity of the Earth through space is exactly 30 km/s. But Einstein rejected the ether theory as invalid. Therefore, he also rejected his own contraction theory or solution. Folsing described Lorentz’s theory as follows. “In the artificial and contrived Lorentzian hypothesis, contraction had been invented solely for the interpretation of the Michelson experiment…” (Folsing, p. 219). Arthur Miller described Lorentz’s hypothesis of the contraction of matter based on velocity as “clearly a physics of desperation” (Miller, p. 28). If Lorentz’s contraction hypothesis was artificial, contrived, and a physics of desperation, how can Einstein’s very similar contraction of matter theory (which uses exactly the same mathematics and ether computations) be logically rationalized to be any different? It cannot. …” (Lorentz, 1895 [Dover, 1952, p. 7]). 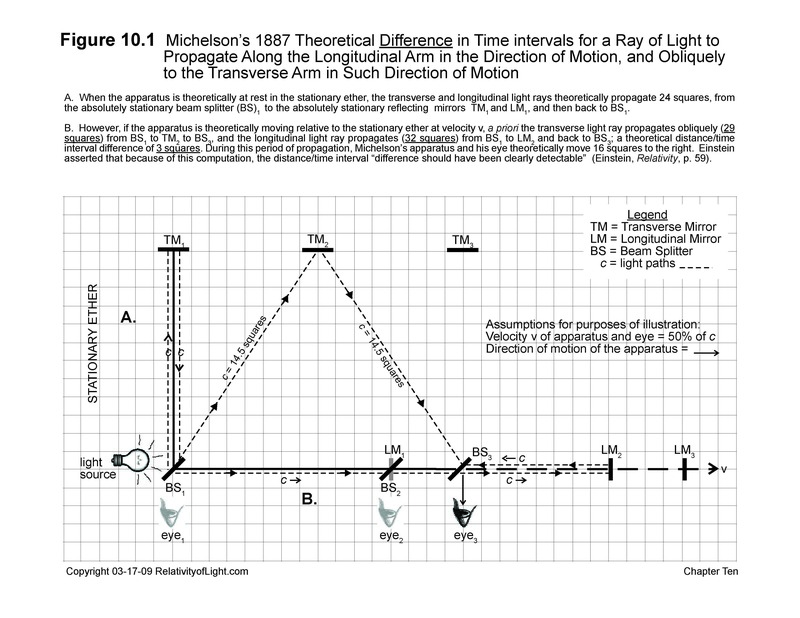 represented the theoretically contracted longitudinal arm in Michelson’s 1887 experiment that was necessary to explain the missing theoretical difference in the time intervals of light propagation assumed by Maxwell, Michelson, Lorentz, and Einstein. All of these are artificial absolute concepts. If the absolute velocity of the Earth (v) remains zero, then the square root of 1 minus zero remains 1, and there is no contraction. According to the ether theory, the only way that this could theoretically happen was if the Earth remained at rest in stationary ether. On the other hand, if the absolute theoretical velocity (v) of the Earth through space is exactly 30 km/s, as Maxwell, Michelson, Lorentz, Fitzgerald, and Einstein assumed, then the above factor produces a mathematical contraction of the length of the longitudinal arm exactly necessary to explain the null result of the M & M experiment. Another fascinating coincidence! But if the velocity (absolute or relative) of the Earth is 225 km/s, or 310 km/s, or 455 km/s, or any other relative velocity (as we now know it to be), then the null result of the M & M experiment is not explained. Why? Because the longitudinal arm would theoretically contract much more than the exact amount necessary to explain the missing time interval in the M & M experiment, and such much shorter distance for light to propagate would a priori produce a large fringe shift (possibly equal to 100% of a wavelength). None of these contraction theories explain Michelson’s null results, nor make any sense. “In…his 1895 monograph, [Lorentz] did not rationalize or justify [his contraction factors]. He did not derive them. He seems to have worked backwards in order to determine what…would be necessary…” (Goldberg, p. 99). (Chart 15.4B). 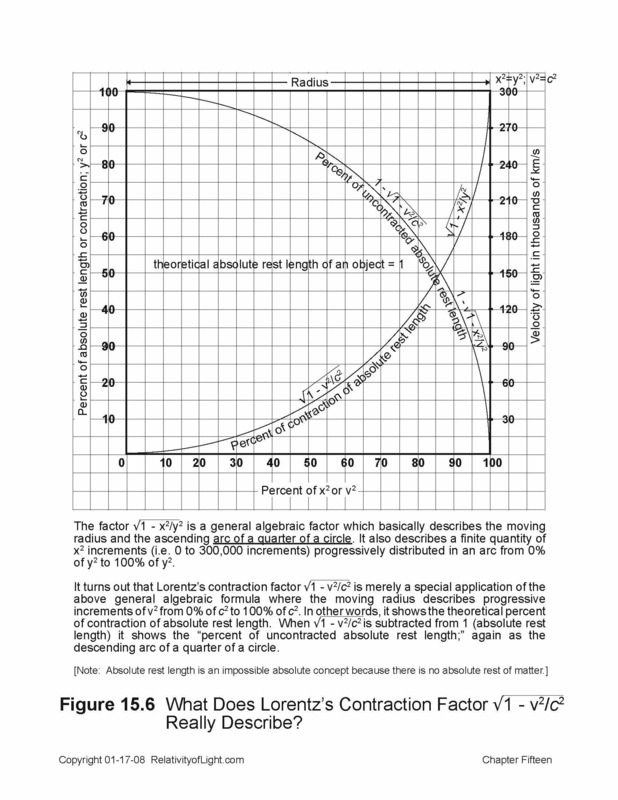 When these two different contraction factors and their numerical computations are plotted on a graph, Fitzgerald’s velocity and contraction values correlate exactly with his theory (Figure 15.3), but they do not correlate with Lorentz’s values (Figure 15.5). Let us again describe the theoretical reasons for these different values. represented the theoretical contraction in distance of the longitudinal arm in Michelson’s 1881 experiment that would be necessary to explain such missing theoretical difference in time intervals. which produced a smaller theoretical contraction of matter than Fitzgerald’s contraction factor. What is the reason behind these two very different contraction ratios? The obvious reason is that Fitzgerald was attempting to explain away a specific larger theoretical difference in time intervals, and Lorentz was attempting to explain away a different smaller specific difference in time intervals. The theoretical time interval difference that Fitzgerald was trying to explain away in Michelson’s 1881 experiment was equivalent to 10% of a wavelength. Whereas, the smaller theoretical time interval difference which Lorentz was attempting to explain away in M & M’s 1887 experiment was equivalent to only 4% of a wavelength. Again, what was the reason for these theoretical differences in specific time intervals? Remember that the primary reason that Michelson had decided to undertake a second experiment with Morley in 1887 was that he believed his 1881 calculation for the specific difference in time intervals was wrong (Chapter 9). In 1887, Michelson assumed that the perpendicular mirror in his apparatus was also displacing from the stationary ether therefore the perpendicular light pencil was also propagating at an angle relative to the direction of the Earth’s solar orbital motion (Figure 9.5), rather than strictly perpendicularly relative thereto (Figures 9.6A and 9.7). 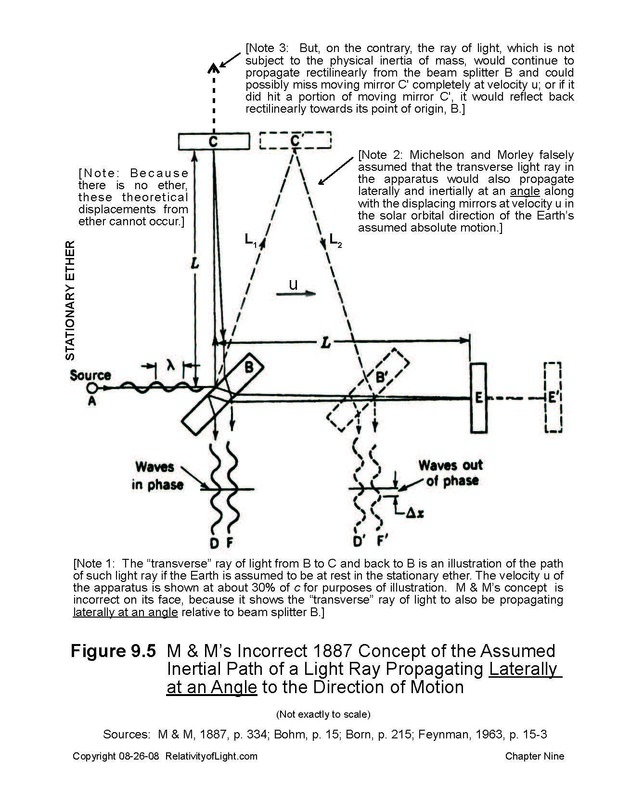 This greater angular distance of propagation resulted in only 40% of the theoretical specific time interval difference which needed to be detected in his 1881 experiment (M & M, 1887, pp. 334 – 336; Figure 10.1). Remember also that in Chapter 9, we dismissed this arbitrary hypothesis as nonsense, because a light ray has no mass and therefore is not subject to the lateral inertial motion of the Earth. was also incorporated into his 1904 Lorentz transformation equations, which we shall discuss in Chapter 16. These hopelessly flawed Lorentz transformation equations were in turn adopted by Einstein in 1905 as the mathematical foundation for his Special Theory (Einstein, Relativity, Chapter 11 entitled “The Lorentz Transformation,” pp. 34 – 39; and our Chapter 27, infra). Aside from all of its many other problems, which we shall describe in later chapters, Einstein’s Lorentz transformation equations and his Special Theory based thereon can have no validity for the simple reasons described above. The Lorentz transformation was completely ad hoc, artificial, arbitrary and meaningless. How can any theory based on it have any real or justifiable meaning? It cannot! which basically describes the quarter arc of a circle (Figure 15.6). How can the algebraic description of the quarter arc of a circle have any real meaning as the foundational basis for Einstein’s Special Theory? on Figure 15.6. Mathematically, this appeared to work becausea priori the increase in the time interval of light propagating along the progressively displacing longitudinal arm of the M & M apparatus at ever increasing velocities, as compared to the time interval of light propagating at an angle along the transverse arm, was exactly compensated for by such progressively increasing contraction of length (distance) of the longitudinal arm (Einstein, Relativity, p. 59). In other words, the distance/time interval for a light ray at c to propagate a progressively greater contracted distance in the longitudinal direction of motion, and to propagate an unchanging distance in a direction substantially transverse to such motion, would be exactly the same (Figure 15.3). Therefore, a priori, no fringe shift for Michelson would result. 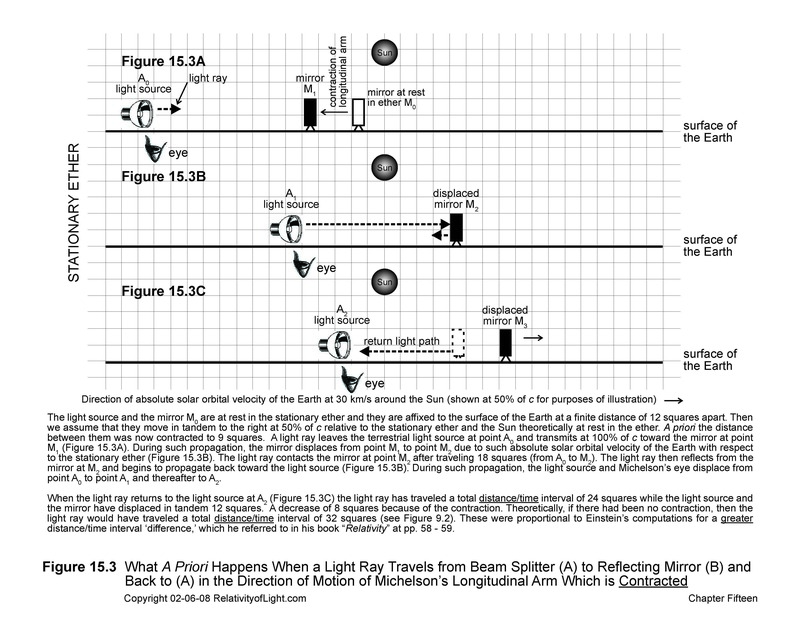 At the solar orbital velocity of the Earth (30 km/s) a miniscule difference in the time interval (shown just to the right of zero on Figure 15.5) could not be visually detected by Michelson. It could only theoretically be detected by the fringe shift of interfering light waves in an interferometer. Because this method did not detect the expected difference in the assumed time intervals, Fitzgerald suggested that almost the only hypothesis that could reconcile Michelson’s 1881 null result was his contraction of matter theory (Fitzgerald, Science Newspaper, Vol. XIII, No. 378, 1889, p. 390). However, as we discussed in Chapters 10 and 12, now other much more viable hypotheses and explanations do exist. What theoretically happens at the other end of Lorentz’s circular “arc of contractions,” when the theoretical velocity of Michelson’s apparatus equals or almost equals the velocity of light: v2 = c2? According to the mathematical contraction factors of Fitzgerald, Lorentz, and Einstein, the longitudinal arm of the apparatus contracts to zero length; Michelson, his apparatus, and the Earth also contract to zero length and become one dimensional, but the transverse arm of the apparatus remains uncontracted at ‘rest length’ (Einstein, Relativity, p. 41). If this zero length apparatus is then somehow rotated through 90º, a priori the former transverse arm at rest length will immediately contract to zero length and the former longitudinal arm will immediately spring back from zero length to its uncontracted rest length. All of such mathematical contraction theories obviously cannot withstand their logical maximum extensions. that had inspired the Michelson-Morley experiment” (Hoffmann, 1983, p. 82). All of these ad hoc attempted justifications are also meaningless. There is also another problem. According to Fitzgerald, Lorentz, and Einstein, the M & M apparatus contracted in the direction of the Earth’s motion by a specific amount, “the amount of contraction being just sufficient to compensate for the difference in time” (Einstein, Relativity, p. 59). However, based on current knowledge of the universe, this concept requires us to ask the question: What motion of the Earth were they all referring to, and what was the specific amount of the contraction? Was the motion of the Earth its solar orbital velocity of 30 km/s relative to the Sun, 225 km/s relative to the core of the MW Galaxy, 310 km/s relative to the Andromeda Galaxy, 450 km/s relative to stars on the other side of the MW galaxy, or some other velocity? If there is no absolute or single specific velocity of the Earth through space, how can there be a specific physical contraction of the apparatus exactly sufficient to compensate for it? Michelson’s apparatus could not be physically contracting relative to a multitude of different specific magnitudes of velocity all at the same time. By the same token, Michelson’s apparatus could not selectively choose just one relative velocity of the Earth (to the exclusion of all others) in order to decide what distance its longitudinal arm must contract (Chapter 10B). Therefore, there can be no meaning nor validity to Fitzgerald’s, Lorentz’s and Einstein’s assertions that the dimensions of a rigid body (vis. the Earth and Michelson’s apparatus) physically contracts to a specific magnitude in its specific direction of its one specific velocity through space, or with respect to the non-existent ether (Lorentz, 1904 [Dover, 1952, pp. 11, 21, 28]). Nor can there be any meaning or validity to Einstein’s assertions that the “difference in time” intervals “should have been clearly detectible” and that Lorentz’s contraction solution for the null result “was the right one” (Einstein, Relativity, pp. 58 – 59); or that such specific contraction occurs “with respect to the body of reference chosen in the particular case…” (Ibid, p. 60). Einstein tried to justify the Fitzgerald-Lorentz ether physical contraction concept as the correct explanation for the M & M null result paradox, so that he could claim the M & M null result as an experimental confirmation of his own similar contraction theory (Chapter 36). While at the same time, Einstein and his followers asserted that the contraction was not physical, but merely an illusion of Einstein’s method of measurement “with respect to the body of reference chosen in the particular case…” But Einstein can’t have it both ways. He can’t have his illusionary theoretical cake and physically eat it too! It becomes patently obvious that Fitzgerald and Lorentz’s absolute contraction hypotheses make no sense whatsoever for any purpose. They are both completely artificial and meaningless. They were merely illogical mathematical myths of desperation asserted in an attempt to solve a mystifying empirical paradox and a scientific dilemma. Likewise, such myths of desperation cannot be selectively used by Einstein in an attempt to confirm his equally artificial contraction concept or his equally meaningless Special Theory. Aside from the completely ad hoc nature of Fitzgerald’s, Lorentz’s and Einstein’s contraction hypotheses, their forced, contrived and circular reasoning, and the other concerns already mentioned, there are two more major problems concerning these contraction hypotheses which need to be mentioned. 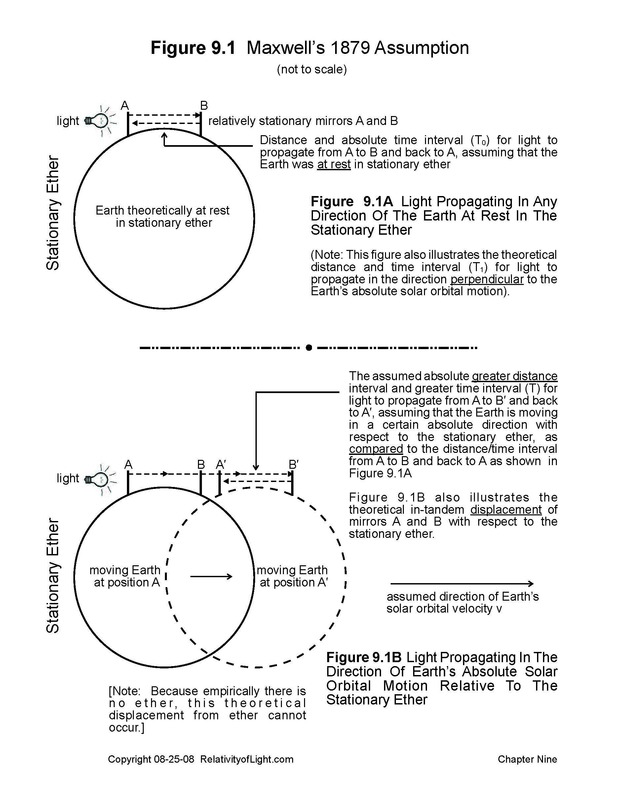 First, the false assumption that light must travel a greater distance in the direction of the Earth’s motions (upon which Einstein’s contraction was based) contradicts the second part of Einstein’s second fundamental postulate that light propagation on the surface of the Earth is independent of the Earth’s motion (Chapter 22F). Second, there was really nothing for Fitzgerald, Lorentz and Einstein to attempt to explain. Michelson’s experiments measured exactly what they were designed to measure: the constant transmission velocity of light at c in all directions, regardless of the assumed motion or direction of its material terrestrial light source (real or imagined), and nothing else. The then widely accepted concept of ether turned out to be non-existent, thus no creative hypothesis could rescue it. No physical terrestrial displacement of Michelson’s mirrors with respect to the ether was possible. The relative motions of the Earth vis-à-vis an infinite number of other co-moving bodies floating in the Cosmos also turned out to be impossible to detect or measure, especially by Michelson’s interferometer method. The paradox of Michelson’s null results was readily explainable on its face, without any contrived hypothesis concerning the contraction of matter (Chapters 10, 11 and 12). Thus, Fitzgerald’s, Lorentz’s, and Einstein’s ad hoc mathematical “theories of desperation” were never even necessary. They were all meaningless, unnecessary, and irrelevant to anything.